Freudenthal Dog Bone Freestall System was engineered to provide superior space for forward lunge and side lunge. This design also makes grooming sand an easy task. Loops are mounted on (2) 2 7/8" O.D. 7 gauge galvanized horizontal rail pipes which are mounted to your building column support posts where needed. 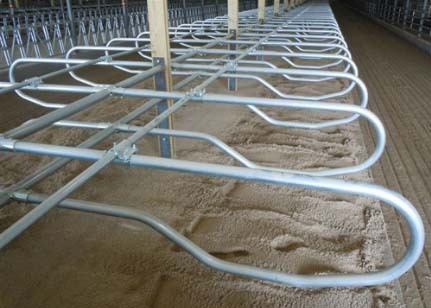 Freestalls are constructed of heavy duty 2/8" O.D. hi strength galvanized pipe with 1.9 (9) gauge top rail for additional strength and boasts a 6 1/4 pound top rail clamp. The weight of our 4-way horizontal rail clamp is 8 pounds which is used on head to head rows. Our 3-way horizontal rail clamp used on outside rows is 7 pounds. The strongest equipment on the market guaranteed. Superior forward and side lunge. 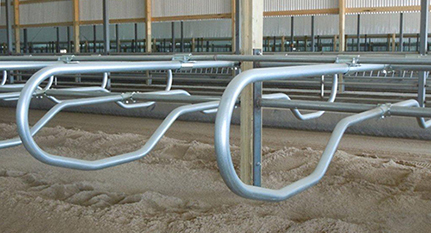 No stall mounts in concrete or sand. Makes grooming sand an easy task. 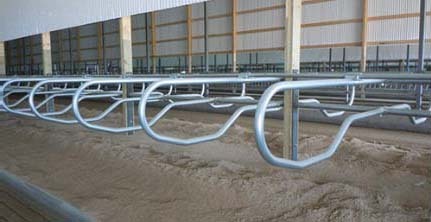 Stall system stays high and dry, resulting in longer life. Head to head and single row options. Much stronger than our competitors rail or beam systems. Compare the weight of this system, heaviest on the market.